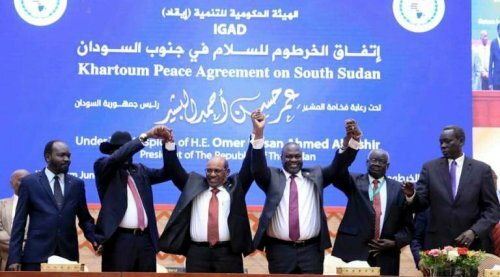 September 17, 2018 (KHARTOUM) – South Sudan President Salva Kiir will visit Khartoum next Friday for a ceremony to celebrate the signing of the revitalized peace agreement, said the Sudanese foreign ministry spokesperson on Monday. In statements attributed to the Foreign Minister El-Dirdeiry Ahmed, Ambassador Gharib Allah Khidir disclosed that President Kiir will attend a ceremony to be organised at the Republican Palace in Khartoum. «President Silva Kiir expressed his desire to meet with all factions of the South Sudanese opposition in Khartoum on Friday in response to the invitation extended to his Excellence by President Omer al-Bashir, the guarantor of the agreement to attend the celebration held at the presidential palace on the occasion of the final signing (of the revitalized peace agreement),» said the statement. He added that «President Silva Kiir Mayardit said he would invite Dr Riek Machar and all the leaders of the South Sudanese opposition groups to come to Juba to attend a ceremony, which he will hold in the capital of South Sudan to celebrate peace». The final peace agreement was signed in Addis Ababa on 12 September after nearly three months of talks in Khartoum where the parties negotiated all the outstanding issues. President al-Bashir had to intervene several times together with President Museveni to persuade the South Sudanese parties to make the needed concessions. The role of the IGAD leaders who had to play the «arbitration court» was praised by the international community which welcomed their sense of joint responsibility. According to his spokesperson, the Sudanese foreign minister confirmed that telephone conversation between President Salva Kiir and Riek Machar who is in Khartoum over the recent fighting in Yei River State. He said the Sudanese mediation «coordinated» the telephone call of President Kiir with SPLM-IO Machar. «During the call, President Salva Kiir stressed that by reviving the peace agreement, the Republic of South Sudan had completely moved from civil war to a sustainable peace,» said the foreign minister. «Also, President Salva Kiir and Dr Riek Machar have assured the importance of continuing to keep in touch by telephone to deal with any breaches of the ceasefire,» stressed the statement. The statement didn’t explain if a Sudanese party was involved in the telephone conversation or Khartoum was just informed about its content. Also, it didn’t say if the connection between South Sudanese leaders was done through the Sudanese presidency or not.